Integrated Learnings: Shared Learning: What Does Mobile Learning Mean to You? What Does Mobile Learning Mean to You? Now here’s my warning: you’re about to get the short form of the “fire hose” version. Brace yourself. The gathering was one in a year-long series hosted by TAG’s Workplace Learning Society (WLS) to examine the past, present practices, and future of learning. 2) It's a technology shift in training that doesn’t require much encouragement. 3) It's pretty dang cost effective. 4) It has the potential to re-shape business relationships with customer without changing how business is done. 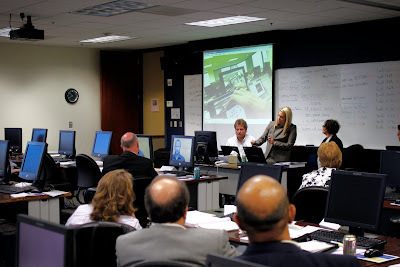 By 2014 millennials will account for 30 percent of the workforce – and millennials expect mobile training, Cohen said. By his own prediction mobile learning will become an accepted industry practice within the next few years. What’s more, by the end of the year (2011), 51 percent of the general population will have a smartphone and many will have more than one device. “Everybody will have one of these devices in the near future,” Gadd said. There are still some technical drawbacks when it comes to implementing mobile learning strategies across a diverse set of mobile operating systems and carriers. Namely, apps must be programed for a specific operating system and screen size, taking time. Cloud computing technologies are still 24-36 months away from being “everything you want it to be for mobile learning” Gadd said, but even then still requires a carrier signal or Wi-Fi connection to access (unlike apps which are stored locally). But Gadd was also quick to point out that multi-device communication was indeed the way of the future. Soon (hopefully) you’ll be able to share files – and training courses – from your BlackBerry to your iPad without skipping a beat. Deborah Thomas of SillyMonkey presented on how to use text messaging to add interactivity within a classroom environment. One of the most eye-opening presentations was Margaret Martin’s, CEO of Merlin Mobility Corporation, demonstration with augmented reality and it’s potential to reshape the customer experience (literally) from the ground up. While it’s a little difficult to explain in detail without demonstrating the technology, the big picture looks at improving a user's experience by accessing the world through a device. Can you imagine in-store directions to find the product you picked out online? How about a real-time 3D rendering of a product on your mobile device? Or scanning a part or instruction booklet during the assembly process for a 3D illustration of how it fits together? Augmented reality may very well reshape general concepts of business and convenience, but it doesn’t mean businesses have to restructure to take advantage of the new technology. Rather, the augmented reality technology relies on various tactics already being used in business – barcodes, illustrations, instruction booklets, etc. – as a trigger for the software. Whew. I'm out of breath.